As you age, your skin naturally begins to sag, wrinkle and develop age spots. An increasing number of skin care companies are adding stem cells to their products with the promise of giving you a younger looking complexion. Stem cells are master cells present in all plants and animals. These powerful cells have the ability to reproduce themselves and regenerate new cells. In skin care products, the most commonly used stem cells come from plants and humans. One popular area of research involves taking stem cells from the leaves, berries, stems or roots of plants and eliminating contaminants through a sterilization process. The stem cells are then cultured in a controlled laboratory to create a more pure form of antioxidants, which are added to the anti-aging skin products, according to Dr. Doris Day, a board certified dermatologist and clinical assistant professor of dermatology at the New York University Langone Medical Center. Antioxidants have been used for years in cosmetics to reduce the effects of free radicals that cause inflammation and sun damage. Extracting antioxidants from plant stem cells ensures a more concentrated, stable product. VB Beauty skin care products use plant stem cells from Swiss apples, Alpine rose leaves and grapes. “VB Beauty primarily uses these products because they are an effective alternative for chemical-based cosmetic ingredients,” says Yvonne von Berg, VB Beauty founder and CEO. Lifeline Stem Cell Skin Care takes a different approach to revitalizing aging skin. It extracts proteins from unfertilized human egg stem cells and uses them to stimulate the skin’s own ability to repair damaged skin cells. “Because they cannot form an embryo and they’ve never been alive, (the human stem cells) avoid all the ethical concerns associated with embryonic stem cell research,” says Dr. Simon Craw, executive vice president of International Stem Cell Corporation, the parent company of Lifeline skin products. 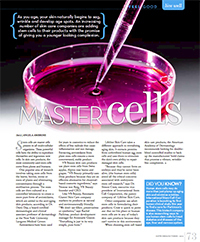 Other companies use adult stem cells in formulating their products. Craw is quick to point out that no live plant or human stem cells are in any of today’s skin care products because they can’t survive in this environment. When choosing skin care products, the American Academy of Dermatology recommends looking for double-blind controlled studies to back up the manufacturers’ bold claims that promise a vibrant, wrinkle-free complexion. Human stem cells may do more than just plump up aging skin and minimize wrinkles. International Stem Cell Corporation is launching its first human clinical study this year to find a cure for Parkinson’s disease. The biotech company is also researching ways to use human stem cells to treat diabetes and diseases of the eye, liver and nervous system.